The Capital One Spark Miles for Business card offers a big bonus and valuable travel rewards, plus valuable mile transfer options. If you are a small business owner looking to earn a flat rate of miles on every purchase you make, the Capital One Spark Miles for Business offers a generous rate that makes it easy to stockpile rewards. Then, you can redeem those miles for any travel purchase with ease – thanks to Capital One’s Purchase Eraser. The current sign-up offer on the Spark Miles card is pretty good – 50,000 miles if you spend $4,500 in the first three months. This is redeemable for $500 if you use it for travel purchases. This is not, however, the best offer the card has ever had. In 2018, the Spark Miles card offered a limited time sign-up bonus that allowed users to snag up to 200,000 miles. While it is unknown if the Spark Miles card will ever offer another limited-time bonus – especially one as valuable as the offer in 2018 – it is possible there will be another boost in the future. Thanks to a flat-earning rate, racking up miles with the Spark Miles card is simple. You’ll earn 2 miles per dollar on every purchase you make, with no limits to how much you can earn. This is a pretty good rate for a business card, and you won’t have to worry about keeping track of bonus categories or weighing your spending. Unlike some business cards – like the Ink Business Preferred Credit Card – the Spark Miles does not offer any sort of boost for redeeming miles a certain way. You won’t be able to improve the value of your miles by redeeming through the Capital One travel portal. Whether you redeem for travel booked with Capital One or on a third-party travel site, each mile is worth 1 cent. Despite no ability to stretch point value, the flat earning rate on the Spark Miles card still ranks it relatively high among popular business cards. The redemption options on the Spark Miles card are very flexible. With the Purchase Eraser, you can redeem miles for any travel purchase you’ve made in the last 90 days. You just choose the “Redeem a Purchase” option on your online account or mobile app and you’ll be able to view a list of qualifying purchases. Then you can choose to use miles to cover all or part of that purchase. Tip: To determine which purchases count as travel, Capital One uses merchant category codes. Sometimes, non-traditional purchases like UberEATS orders will code as travel – allowing you to use miles for a wide variety of transactions. If you aren’t sure how a merchant will code on your statement, you can try making a small purchase and seeing how it displays. By choosing this option, you can search for travel deals on third-party sites and still get the full value out of your miles. Unfortunately, not all redemption options are as lucrative as travel redemptions. If you choose to redeem your miles for a statement credit – for example – you’ll get half their normal value. In addition to the standard redemption options, the Spark Miles card lets cardholders transfer their miles to one of 14 frequent flyer partners. The transfer rate isn’t as good as other issuers, at 1.5 partner miles for every 2 Capital One miles transferred (Amex, Citi and Chase allow you to transfer points at a 1:1 ratio). However, since many of the travel partners offer a mile value higher than 1 cent per mile, you can occasionally get more out of your rewards by transferring. While there are no major airlines on the list, frequent flyers of Aeroplan (Air Canada), Avianca, Etihad and Singapore Airlines can often stretch their miles a bit further by transferring. Year-end account summaries – Download a custom, itemized spend report each quarter and year. Quickbooks downloads – To help you better manage your spending, the Spark Miles card allows you to download purchase records directly to software like Quickbooks, Quicken or Excel. Visa SavingsEdge – With the Spark Miles card, you are eligible to enroll in Visa SavingsEdge, a card-linked offer program designed to help you save on everyday business purchases. Car rental insurance – For rental cars booked and paid with the Spark Miles card, you can receive primary coverage up to the cash value of the vehicle (for business car rentals). All of these perks are designed to help you save money, whether through better spending visualization or coverage in the case of an accident. To get the most out of these perks, put all your business spending on the card. Though the Spark Miles card does include some valuable benefits for small businesses, it lacks a few key features. For example, you can add employees to your account for no additional fee, but you cannot manage those accounts remotely or set limits on individual spending. Also, while the card offers an app to help tag receipts and manage purchases, the app is designed for personal card users and doesn’t let business card owners track employee spending. The Spark Miles card is a business credit card, so qualifying might be a bit more difficult than a personal card. It is designed for users with excellent credit (above 750). Plus, you’ll have to submit information about your business including your TIN or EIN (or SSN if you are a sole-proprietorship or single-member LLC), business ownership type, annual revenue and spend per month. There are no specified qualifications for business size or spend, but it is important that you have a good individual credit history. Tip: Don’t forget to consider the effect of a small business credit card on your personal credit score. Depending on the type of business you have, some of your business activity might display on your personal credit report. Among major issuers, Capital One’s customer services rates good, but not great. In J.D. Power’s 2018 customer satisfaction survey, the bank rated 803, coming in fifth out of 11 credit card issuers. On the plus side, it’s app rates well among users – rating 4.7 out of 5 in the Google Play Store and 4.6 out of 5 in the Apple App Store. The bank also offers 24/7 customer service and an online chat feature – though you might have to do a little digging to find it. How does the Spark Miles compare to other cards? 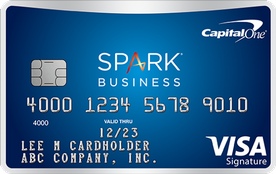 Similar to the Spark Miles card, the Spark Cash offers a flat 2 percent rate on every purchase. What sets it apart is that it offers cash back rather than travel miles. For many spenders, this might be the better Capital One small business choice. Since cash back is much more flexible than miles, you can always cash out your rewards and use them for travel purchases. Rather than a flat rate of rewards, the Ink Business Preferred card offers 3 points per dollar in several bonus categories: travel, shipping, internet, cable, phone services and advertising purchases (up to $150,000 in combine purchases yearly). If you spend heavily in any of those categories, you can significantly boost the rewards rate on this card. Plus, you’ll get a higher point value on any points you redeem for travel through the Ultimate Rewards portal. The Blue Business Plus American Express card comes with a similar flat rate of rewards as the Spark Miles, but it includes a $50,000 yearly spend cap on that rate. It also doesn’t come with any sort of introductory bonus. On the plus side, American Express has a much more extensive list of travel partners with a better transfer rate (1:1 for most partners). Cardholders can transfer points to major airlines like Delta and British Airways. Who should apply for the Capital One Spark Miles card? Small business owners looking for a good flat rate of rewards. Frequent travelers who prefer hunting for deals on third-party sites to using a bank’s travel portal. Cardholders looking to add employee cards at no extra fee. Cardholders who will take advantage of budget and spend tracking tools. Use the card for most of your purchases to take advantage of a good flat earning rate and budget tracking tools. Add employee cards for no extra cost, but remember you can’t set individual spending limits. Redeem miles for travel purchases or transfer to a travel partner to get the most value out of them. Avoid carrying a balance on this card to avoid racking up interest. Take advantage of Visa SavingsEdge to save on business purchases. Is the Capital One Spark Miles card worth it? If you are the kind of cardholder who prefers to keep all your purchases to one card, the Spark Miles offers one of the best flat rates available among business cards. However, users who want to redeem their miles for anything other than travel might be better off opting for the Capital One® Spark® Cash for Business. You’ll enjoy the same business perks and rewards rate with much more flexible redemption options.